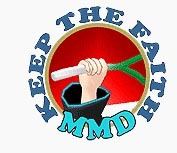 How do I make titles for my MMD videos? How can I float type over my MikuMikuDance animation? 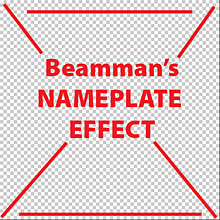 Let’s learn to use Beamman’s Nameplate Effect … it’s Easy! 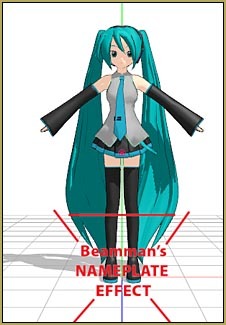 I first read about the Nameplate Effect on the now defunct Mikudance.info. I have used nameplate several times over the last couple of years. 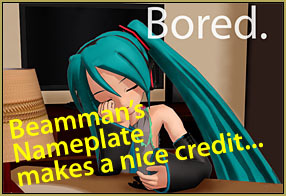 In my “Bored.” animation, I used Beamman’s Nameplate for the opening and closing credits. Like many effects, Nameplate can be adjusted for size and transparency using the Si and Tr settings in the AMP … and it moves between your registered positions so that the size and transparency can change while you watch … this means that titles can appear to fade-in and fade-out. … Oddly, Nameplate cannot be rotated or moved to the front or the rear (Z-axis) … You can attach it to a dummy bone and then move it left/right/up/down … but, again, Z doesn’t work … and you cannot rotate it. What it DOES do is stay in front, on top, and always faces the camera. You can swing your camera to change the view of your scene, zoom-in/zoom-out … while the Nameplate stays in place on your screen; unmoving, unchanged. 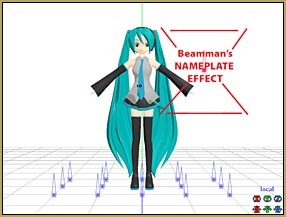 Beamman’s effect is available from http://www43.atwiki.jp/beamman/ and I have put together an English download for it on the LearnMMD Downloads page. Create the art for your Nameplate. 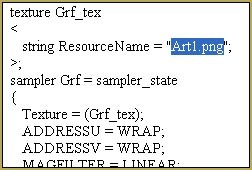 The image must be 512×512 pixels … and saved as a PNG. You can use transparency and transparent areas … Like set your type on a transparent layer and save as a PNG. 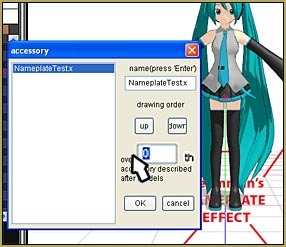 Open MikuMikuDance … Load a model (Miku, of course “:o) … Get into Camera mode and Load your nameplate .x … Art1.x in our example. The effect should appear on the screen … but it MAY be UNDER your model, rather than on top. Fix that by going to the BACKGROUND menu tab and choose the top item on the list: Accessory Edit. Click on UP a few times to be sure it’s at the top of the list … and I set that digit to Zero, as shown in that picture. Now we see our PNG image on top of everything on the screen. Make the effect look bigger or smaller by adjusting the Si setting … and set the transparency using the Tr setting. Attach the effect to a Dummy Bone … and move the bone to move the PNG into place. Again, the effect can follow your registered commands … so set the Tr at Zero to make the effect invisible in frame 20 … and set Tr to 100% in frame 40 … press PLAY and watch as your image fades into being! … You can check/uncheck the DISPLAY box in the AMP to switch it off, completely. You can load multiple instances of Nameplate … and create a kind of a slide-show by bringing them up, one after another … as in the closing credits of my “Bored.” video. Were do I find the Namplate .x file. Just a little something about the download link-if clicked it leads to learnnm.com/ blahbehdiblahbehdiblaaah, but if you change it to learnmmd.com/ blahbehdiblahbehdiblaaah, it should work. Rosechaaan – Thank you for pointing out that bad link … I just fixed it!